They can be mean and nasty, and they can mess up our planet big time. They are near-Earth objects, dubbed NEOs, celestial flotsam such as asteroids or comets that can, and have, scored direct hits on our humble home planet. A new international consortium has been launched to address the impact threat to Earth, but, more pointedly, to organize, prepare and implement mitigation measures. Called NEOShield, the European Commission is providing a significant amount of euros to support the initiative. The undertaking consists of research institutes, universities and industrial partners in Germany, France, the United Kingdom and Spain, as well as in the U.S. and Russia. The primary aim of NEOShield is to investigate in detail the three most promising asteroid threat-reduction techniques: kinetic impactors, gravity tractors, and the explosive blast-deflection method. That's the crux of the undertaking as spelled out by Alan Harris, a senior scientist and NEOShield project leader at the German Aerospace Center's Institute of Planetary Research in Berlin-Adlershof, Germany. The DLR is the coordinating partner for the multiyear NEOShield project and is set to roll out the plan this week. 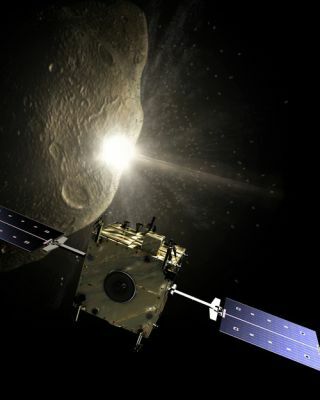 In this week's meeting, specialists from Europe, for example, will draw upon their past kinetic impactor work on the European Space Agency's study of a mission tagged as Don Quijote — an idea for an asteroid-deflection precursor mission drawn up several years ago. NEOShield work will employ sophisticated computer modeling and simulations. Those will enable researchers to scale up knowledge and apply that information to a real-case scenario that calls for a spacecraft-deployed impactor slamming into a real asteroid in space. "NEOShield was launched in mid-January and, over the next three and a half years, will investigate the measures that can be employed to prevent near-Earth objects such as asteroids and comets from colliding with Earth," DLR officials said in a statement. In doing so, the consortium, which received 4 million euros in funding from the European Union, will investigate the properties of near-Earth objects and develop a strategy for an impending collision." Over the past few years, specialists have been scoping out the gravity tractor idea. That concept makes use of a spacecraft that could sidetrack a NEO without physically contacting it, using only gravitational forces to alter the object’s trajectory. Then there's the big daddy of NEO mitigation thoughts: the nuke 'em approach. On the one hand, the use of nuclear explosives in space is clearly controversial and politically extremely delicate, Harris said. Still, no project dealing with the impact hazard, he added, would be complete without studying this option of "final desperation"… whereby our planet is endangered by a very large object or one for which we Earthlings are given a short warning time. "For an asteroid with a diameter of more than half a mile or a warning time of less than five years, the 'blast-deflection' method may be the only feasible approach," Harris said. "Our Russian colleagues will be looking in detail at the physics of how an asteroid would respond to a nuclear explosion near, or on, its surface." Harris said the Russians will also be looking at what the outcome might be in the event a deflection attempt doesn't quite succeed "and we're left with chunks of asteroid — or even a whole one — entering the Earth's atmosphere and causing damage on the surface." As for bomb-blasting NEO experiments, Harris stressed: "We do not advocate testing nuclear explosives in space and will not be studying nuclear weapons technology." The final goal of the project is to use the knowledge gained in the studies to come up with advanced designs for asteroid mitigation test missions, Harris said, to demonstrate the feasibility of the kinetic impactor and the gravity tractor. For example, one option that may be considered is a combined kinetic impactor and gravity tractor demonstration mission. That would involve a reconnaissance spacecraft used to observe the effects of the kinetic impactor that's redeployed as a gravity tractor after the impact. This is, however, likely to be an expensive option, Harris added, "so we will also consider cheaper alternatives to demonstrating one or more of the concepts developed in the course of the project. Any other mitigation concepts that seem feasible and potentially effective may also be studied in the course of the 3.5-year project." Also on the NEOShield to-do list is developing a decision-making tool to aid in response planning. Establishing that tool also embraces the creation of a global response road map in collaboration with partners such as the United Nations, space agencies and other entities. NEOShield is welcome news, said former astronaut Rusty Schweickart, past chairman of the B612 Foundation, a group dedicated to predicting and preventing cataclysmic asteroid impacts on Earth. He views the effort as the first serious, comprehensive, professional analysis of NEO deflection, one that, hopefully, will deal with its full complexity. “It is being done by an international group of participants. This will be key, in the end, to insure that the results are widely accepted,” Schweickart said. “Given that there are serious and extremely challenging geopolitical implications to any NEO deflection, this element is very valuable,” he emphasized. The timing for the NEOShield multiyear enterprise is good, Schweickart observed. First of all, the discovery rate of NEOs will likely be going up steeply in the near future. "We will be discovering an ever increasing number of them that pose decision challenges for the global community," Schweickart told SPACE.com. "There is an essential element in all this that is not widely appreciated … the development of a 'game plan.' This is distinct from executing the 'game plan'… but without having thought through the options, criteria, triggering elements and such ahead of time, no action will ever be taken,” Schweickart said. "Developing the game plan will be necessary much more frequently than actually executing it." Schweickart said NEOShield could spotlight what the best options and combination of options are for a variety of challenging situations in dealing with the NEOs. "One of the most important elements will be the almost virgin territory of looking at decision and execution timelines," Schweickart said. The difficult reality in addressing NEO impact threats, Schweickart concluded, is that action will often have to be taken before the impact probability is high enough to make the benefit/cost an easy decision. "Waiting for comfortable decisions however assures — in many cases — that it will then be too late to act."